Blue Horizon (Formerly 5, Castle Rock) is a luxurious four bedroom, four bathroom property with underfloor heating throughout. The house is set over three storeys with glorious sea views over Port Gaverne and coastal towards Tintagel. An enclosed balcony with bi-fold doors can be opened if required or used as a lounge extension from which to enjoy the views of the ocean. This property can easily accommodate 7 by using all of the available bedrooms but we believe the lounge area is most comfortable for up to 6 people. All beds will be made up for your arrival. Entered from the allocated parking spot onto the ground floor where there are two twin bedrooms (one en suite) and a separate shower room. The first twin has two x 3' single beds, bedside table and lamp, wardrobe, dressing table with chair and mirror and an en suite shower room. The shower room is fully tiled and has a mixer shower, toilet and matching handbasin with mirror and shaver point over and a towel radiator. The second twin room has two x 3' single beds, bedside table and lamp, dressing table with chair and mirror and a built-in wardrobe. The separate shower room is fully tiled with a mixer shower, toilet and matching handbasin with mirror and shaver point and a towel radiator. On the first floor is the main open-plan living area. The kitchen is fully equipped with washer/dryer, dishwasher, fridge, freezer, microwave, electric oven and hob with extractor over and granite work surfaces. The large lounge/diner has a dining table and eight chairs, comfortable leather sofas, large flatscreen LCD TV with freeview and DVD player. 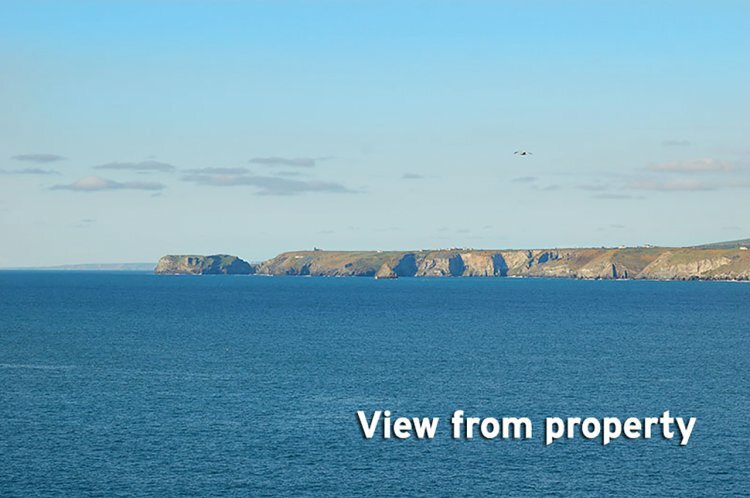 From here you have extensive coastal views towards Tintagel. Access to the balcony where there is a table and chairs for two to enjoy your morning coffee or a well-deserved glass of wine. The second floor has two further bedrooms, one en suite, and a further bathroom. The main bedroom is a large double room with small LCD TV, built-in wardrobes and a chest of drawers, with an en suite shower room. The sea views from this level are wonderful! The second bedroom has a 3' single, bedside light, built-in wardrobe and drawer space. The separate bathroom has a bath with matching toilet and Travertine handbasin with mirror and shaver point above and a towel radiator. At the rear is a private enclosed patio area, an absolute sun trap, where a large patio table and eight chairs are provided for some al fresco dining if the weather is right. Port Isaac Harbour is a short five minute walk away, famous for the 'Fisherman's Friends' who perform regularly outside the pub through the summer, and as the location for 'Doc Martin'. The South West Coastal Footpath is right on your doorstep offering miles of cliff top walking in either direction. Outside is allocated parking for one vehicle and several guest spaces where it is normally possible to park easily.